A tale of two Sessions — pot’s big break? The good news: Americans paid off their credit cards a little bit in September. The bad news: The balance is down only slightly from the record levels of August. The Federal Reserve issued its monthly consumer credit figures late yesterday. The outstanding balance on Americans’ revolving credit — that is, credit cards — totals $1.041 trillion. That’s an unexpected drop of $312 million from a month earlier. Actually, there’ve been five small drops like that this year — a stark contrast with the years 2014–17, when there wasn’t a single monthly drop at all. Are people wising up, however slowly? Do they sense the proverbial rainy day is coming? Around here, we’ve said all year we’re in the late boom phase of the boom-bust cycle. That’s one reason we’ve recruited Rich Dad Poor Dad author Robert Kiyosaki to bring his unique insights to the Agora Financial team. What’s the difference, you ask? And what kind of debt makes you richer, anyway? While we’re on the subject, we’ll quickly elaborate on a point from Robert’s riff about homeownership yesterday. As it happens, he and his wife Kim own their own abode. But investment real estate? That’s another matter entirely. “When I use debt to my advantage—essentially creating tax-free money—to invest in real estate, it increases my cash flow,” Robert explains. “Not only do I not pay taxes on my debt, [but] I also pay little to no taxes on the income from that debt. I earn more but pay less in taxes. “Most financial ‘experts’ would say I’m crazy when I say to ‘fight debt with debt,’” Robert acknowledges. “They’ll say my advice is flawed. And I’ll be the first person to agree — if the advice is going to someone who doesn’t understand money. “But I ask you to step back and take a look at the world of finance. Wall Street is able to take your debt and turn it into their asset. That’s what financially smart people do, and it’s one example of why rich people get richer. As we said last week, for Robert it all comes back to financial education — or the lack thereof — in schools. [Ed. note: We’re less than a week away from Robert’s Weekly Cash Flow Summit — perhaps our biggest event all year. Robert will reveal a revolutionary technique to generate cash flow every week — anywhere from $840… to $4,540… to as high as $10,600. It works in any market environment. So if you’re worried the boom will soon turn to bust, you’re covered. And if you think the good times will keep on rolling, it’ll work for you too. But the only way you can make it work is if you educate yourself about the process. And that’s what the Weekly Cash Flow Summit is all about. The U.S. stock market is taking a breather after a solid post-election relief rally. The Dow, S&P 500 and Nasdaq all posted gains of more than 2% yesterday. Today, they’re pancake-flat — the Dow up slightly, the S&P and Nasdaq down slightly. Gold has backed off a bit to $1,223. Otherwise, traders are marking time till the release of the Federal Reserve’s latest “policy statement” at the conclusion of its every-six-weeks meeting this afternoon. No one expects the Fed to bump up the fed funds rate this time, but traders will try to decipher the statement for new clues to the Fed’s intentions going into 2019 — not unlike how a witch doctor studies entrails. If there’s anything truly noteworthy, we’ll follow up tomorrow. At last check, a barrel of WTI fetches barely $61 — a 20% drop from a peak of $76 only a month ago. In recent days, the following notion has become conventional wisdom: Even though Washington has reimposed sanctions on Iran as of Monday, eight nations, including China and India, have gotten waivers so they can continue purchasing Iranian oil. 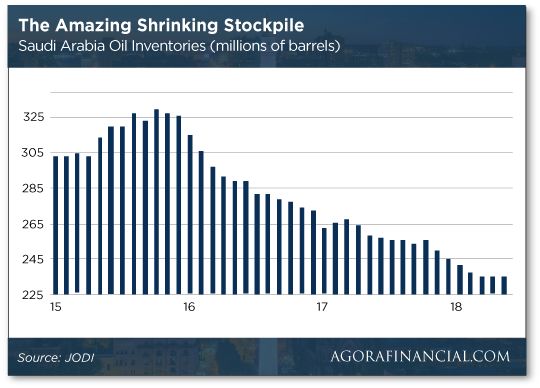 And if any Iranian oil is kept from coming to market, Washington’s head-chopping friends in Saudi Arabia will just open the spigots wider. But what if the House of Saud can’t open the spigots wider? “Saudi Crown Prince Mohammed bin Salman is always willing to assure the world that Saudi Arabia is ready to act to balance the global oil market when needed,” our Zach Scheidt reminds us. “And we know what a stand-up guy he is, right? “Surely he wouldn’t exaggerate what Saudi oil production is capable of? “The fact is the country might be overstating how much oil it’s producing right now! “Also raising eyebrows,” Zach tells us, “is the Saudi drilling rig count, which has been increasing steadily. It is now 33% higher than where it normally stands. Again, this is despite the fact that its production is flat. This isn’t the first time we’ve said Saudi Arabia’s vaunted role as the world’s “swing producer” is overblown. But it’s worth revisiting at a time like now… because this recent drop in oil prices probably won’t have much staying power. Defense stocks are among the beneficiaries of the post-election bounce. ITA, the big military-sector ETF, has rallied from about $198 at the close Monday to $200 as we write. And specific names in the sector, like the one Jim Rickards suggested to his premium subscribers, are doing even better. If you were with us on Monday, you know Jim was willing to stick his neck out and forecast the GOP would hold onto the House. Events didn’t break that way, but his “asymmetric” trade recommendation — with upside no matter the outcome — is performing just as intended. After all, Democrats love having pork-barrel defense projects in their districts just as much as Republicans. Thus, Jim’s recommended call options on one of the “Big 5” defense stocks are solidly in the green this morning and have the potential to double in value by next spring. You’ve probably heard about how Attorney General Jeff Sessions “got quit,” as the saying goes. But in addition, voters gave the boot to House Rules Committee Chairman Pete Sessions (R-Texas) after 11 terms. 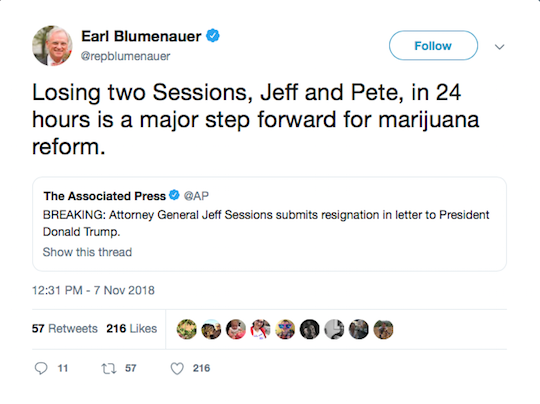 Pete Sessions — no relation, by the way — single-handedly blocked the House from voting on a host of cannabis reform measures, including ones proposed by the author of the above tweet, Rep. Earl Blumenauer (D-Oregon). As for Jeff Sessions, we’ve chronicled for two years how he’s one of the last unreconstructed weed warriors. But we’ve also chronicled how he’s been ineffectual in stopping the wave of legalization on the state level — something he himself would acknowledge in candid moments. Now that he’s gone, the worst-case scenario is more of the same under whoever Trump names as a replacement. Is that so bad? A best-case scenario would be Donald Trump formally announcing a policy that enforcement would be left up to the states — something that’s been rumored around D.C. for months now — and a willingness to sign bipartisan reforms sponsored by the likes of Blumenauer and Trump ally Rep. Dana Rohrabacher (R-California). For Trump, it would be smart politics — blunting (so to speak) the impact of an issue that engenders hostility toward him among younger voters. “Couldn’t you have wasted five seconds somewhere early in Tuesday’s 5 so that your California pot correspondent’s comment would have appeared at 4:20 instead of 4:15? “Anyway, it sounds like California is running its legal pot business the same way they run their daily lottery — badly. They started their daily lottery decades ago, ostensibly to put a dent in the numbers business. But the private numbers runners pay off at 30–50% higher than the state, pick up your slips at your house and deliver your winnings to you. “Political weedfeed greed,” is the subject line of an email after we solicited feedback from North Dakota, the only state where a cannabis measure failed on Tuesday. “Although I do not live in the ‘Peace Garden’ state, I have monitored several states’ legislative attempts to garner excessive taxes, fees, permit costs, fines, etc., for legalization of both medical and recreational marijuana. “Catastrifornia is a perfect example. After legalizing both medical and recreational marijuana, the bureaucracy authored so many different levies on producers and retailers that many of the key-component participants backed out of doing business there. Arizona is another state where politicians and bureaucrats have their heads where the sun doesn’t shine. The 5: It’ll take time, but the politicos will figure it out. P.S. You’re invited to the Weekly Cash Flow Summit — a special event hosted by No. 1 best-selling personal finance author Robert Kiyosaki. This event is Robert’s debut as a member of the Agora Financial family. And more important, it’s your chance to learn about an entirely new way to pull in weekly payouts. We’re talking anywhere from $840 to as much as $10,600. Every week. We’re all set for next Wednesday, Nov. 14, at 1:00 p.m. EST. It won’t cost you a thing to watch this event, but we do have a cap on the number of viewers and we expect the slots to fill quickly. Click here now to reserve your spot.